Best Quick Weight Loss Tips to Build up Your Health . Without good quick weight loss tips, a healthcare professional at 19 got a prescribed popular slimming pill in order to lose some weight. After consuming for about four months, her weight dropped from 63kg to 59kg. She could fit into the clothes she desired. But she had to pay a high price for the short term weight loss. She experienced a sharp pain in her bladder the day before. The next day, the healthcare professional in Singapore passed stools that had maroon-colored blood – enough to fill a drink can. She was finally hospitalized in the National University Hospital of Singapore. According to the diagnosis, her small intestine was eroded. What happened to the healthcare professional after her discharge from the hospital? She put on weight and returned to her original weight. She was weaker and had lower body energy after her hospitalization due to the nasty side effects of the slimming pill. If she had known the quick weight loss tips how to lose weight and keep it off naturally, she would have no need for slimming pills and she would not have been hospitalized. As a healthcare professional, she was supposed to be the role model for others. She was supposed to know the quick weight loss tips how to lose weight and be healthy. But in reality, we found that they are as helpless as the rest. According to a report published in Journal of the American Academy of Nurse Practitioners (May 2008), a mailed survey to 4980 randomly selected registered nurses from one state in USA revealed that almost 54% were overweight or obese. Forty percent are unable to lose weight despite healthy diet and exercise habits. As you know, most slimming pills are designed to help you suppress your appetite. The theory is as follows: the worse your appetite, the less food you may eat, the more calorie deficit you can create, the more fat you can lose and the slimmer you are. But why do you feel hungry? Hunger is our bodies' way of driving us to find food and eat to stay alive. It is a very powerful human instinct. When you are hungry, your body intends to tell you that you need food to provide enough nutrients to your body so that it can function as normal. Or you may feel weak, faint and get sick easily. If you keep yourself hungry for long, you may develop many dreadful diseases, such as shedding hair, early menopause, osteoporosis and many more. Good appetite is the desire to eat some particular food to nourish you. Every of your body cell, every organ and your whole body needs good nutrients to stay alive. If a person were sick and had no appetite, the chances for him to recover from any illnesses would be very slim. 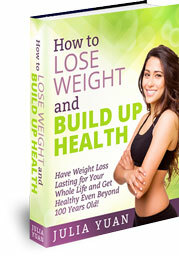 The best quick weight loss tips: can you live against the natural law of hunger and appetite, for your whole life? Can you stay alive with NO appetite? Then how can you take slimming pills to suppress your appetite all your life? If you can’t take slimming pills for your whole life, then it is not a good solution for you to lose weight and keep it off. For short term weight loss, it is not worthwhile to suffer all nasty side effects of slimming pills, as you may lose your precious health. What is more important to you, your precious health or short term weight loss? Not knowing is blocking you from good health. Not knowing is making you deprive yourself of nutritious food and keep you in misery. Not knowing is leading you on the path to lose weight, which is harmful to your health and may lead you to many dreadful diseases. If you want to be healthy and have weight loss lasting for your whole life, you have to nurture your body, mind and soul. If you keep on depriving yourself, you are getting weaker, sicker and prone to many dreadful diseases. If you lose your precious health on your way to lose weight, you will not have the chances to enjoy your life for long! You know the famous saying: that health is not valued till sickness comes. If lighthouses are to guide ships at night, then you must get the quick weight loss tips to lead you on the way to regain health, lose weight and make it lasting for your whole life! I was where you are right now and I know how difficult it is to lose weight and keep it off naturally. Life is not easy, especially for a person with overweight or obesity. But one thing I want you to keep in mind: Never, ever, do anything harmful to your precious health in the name of weight loss, or you may not be able to regain good health. There are right ways to lose weight and keep it off naturally, with healthier body, mind and soul. You are empowered to learn “How to Lose Weight and Build up Health ”, instead of stumbling in the darkness. Would you like to know more about this health improving and lasting weight loss program? Have the Free ebook excerpt delivered to you immediately NOW! Click here. I wish you to get healthy first and foremost; and then you can lose weight and keep it off naturally.